Ogilvie Station is known for providing diners and commuters with an array of options to pick up during lunch or after work, however one thing that it lacked was a good slice of pizza. That is, until Vinny’s Pizza Bar opened. 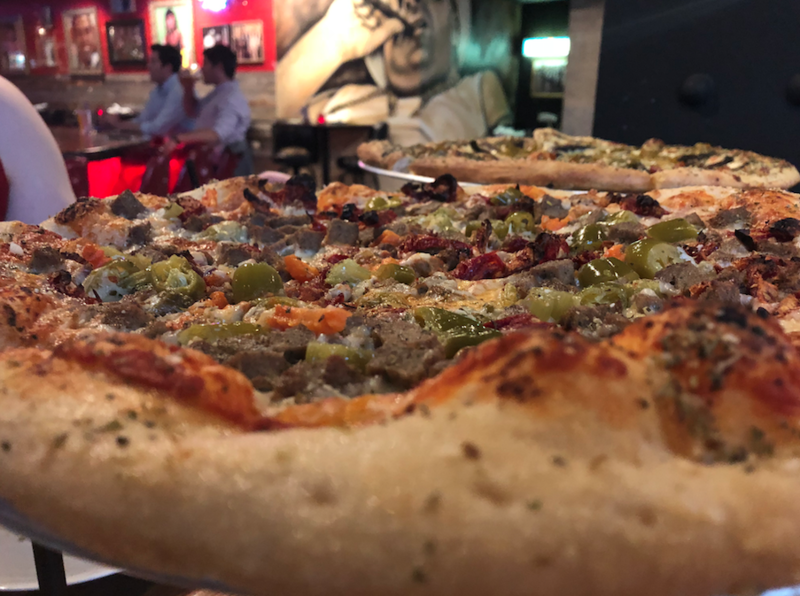 With unique pies and $5 Happy Hour beers, Vinny’s is the perfect place to unwind after a long workday. We find it best to go to Vinny’s with a few of your friends or coworkers in order to try as much as possible. Perhaps the best shareable on the menu is Vinny’s homemade breadsticks ($7). 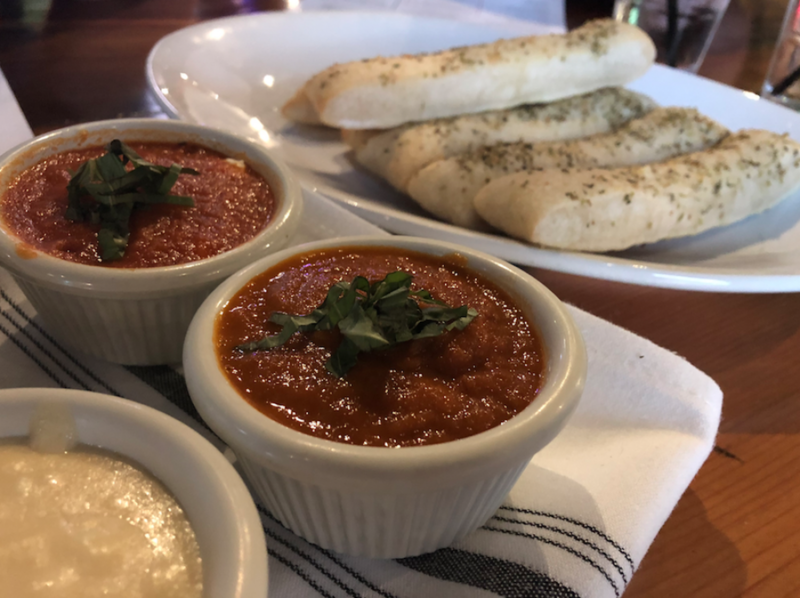 The soft and garlicky sticks are served with your choice of dipping sauces: five cheese fondue, which tastes a lot like a traditional alfredo; housemade marinara, perfectly sweet and acidic as it should be; garlic butter sauce; and a goat cheese marinara that warms your soul. During Happy Hour, enjoy these breadsticks with a beer for only $10. The Fried Calamari and Stuffed Mushrooms are must-try menu staples as well. Don't just try one dipping sauce, try them all! At Vinny’s there is no such thing as ordering too much because if there is any left over, you have lunch for tomorrow. The pizzas are normal size and can be split between 2-3 people. Their unique dough rises as a fluffy and crisp crust, repurposing the ends as dip-able breadsticks, so make sure to order dipping sauces with your pizza. The crowd favorite is the Brie and Apple; a white sauced pizza with a blend of brie and mozzarella cheeses baked with apples and balsamic roasted shallots. Another fave to crave is the Tuscan Meatball and Giardiniera; San Marzano sauce is the base for Vinny’s housemade meatballs, mozzarella and Parmesan cheeses, sundried tomatoes and not-too-spicy Tuscan giardiniera. BBQ Chicken lovers will not be disappointed with the BBQ Chicken and Bacon pie with a base blend of BBQ and San Marzano sauces, mozzarella, chicken, bacon, red onions, garlic oil, pecorino cheese and chili flakes. Last but not least, we also recommend the Mushroom and Peppers pizza. Vinny’s changes it up with a pesto sauce base for this pie and tops it with mozzarella, portabella mushrooms, bell peppers and sundried tomatoes. Vinny’s also offers soups, salads and sandwiches for those not in the mood for pizza. They have a long list of drafts, wine and seasonal cocktails. 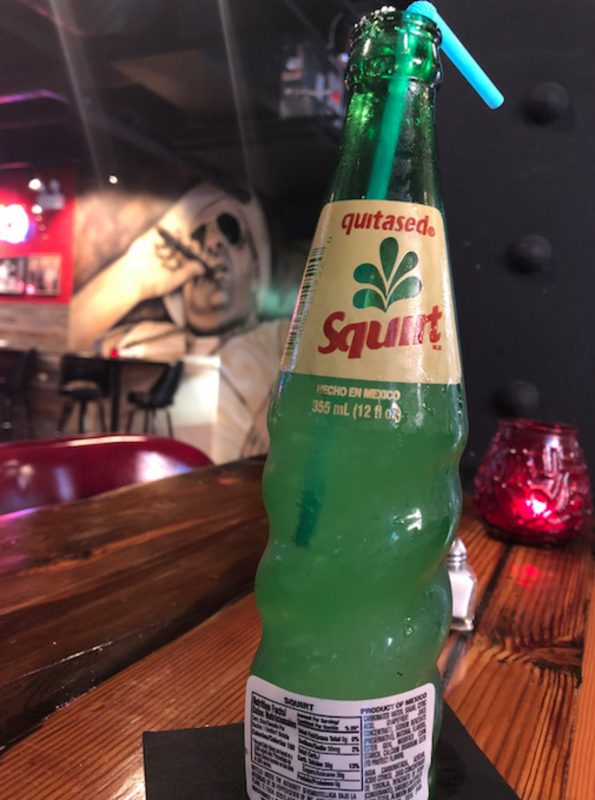 Our cocktail pick is the Paloma served in a Squirt bottle. It’s a sugar buzz in a bottle! Check out the full food and drink menu here. With great Happy Hour deals like $5 Cigar City Drafts and $7 house wine, it’s hard to pass Vinny’s up for drinks before heading home after work. Happy Hour at Vinny’s runs 3PM to 6PM Monday through Friday. Vinny’s Pizza Bar is open Monday through Friday 11AM to 10PM and closed on the weekends. Get ready for sweetness in Paloma in a Bottle!